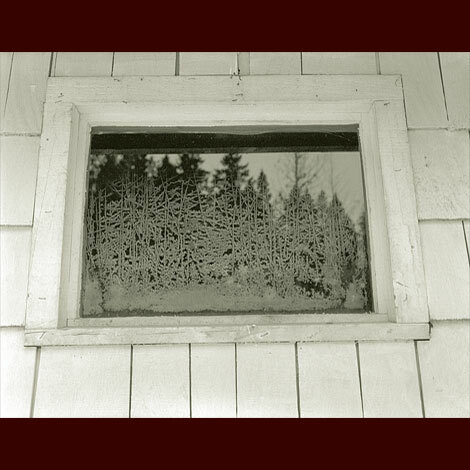 My Mom's garden shed window, with a fresh frost pattern, reflecting the cedar forest behind in the late afternoon of a snowy week on Salt Spring Island. Series Keywords: Black and white photographs of Salt Spring Island, BC, British Columbia, Canada in the snow, frost, winter. Church yard cemetery photographs, photographs of grass and maple wings in the snow, a snowy fence. A frosty window and a cedar forest. Old trophies in the snow.